Open tanks and exterior surfaces of process heating equipment lose heat to the surroundings via convection, radiation, and/or evaporation. A practical way of reducing heat loss is by insulating or covering the surfaces. 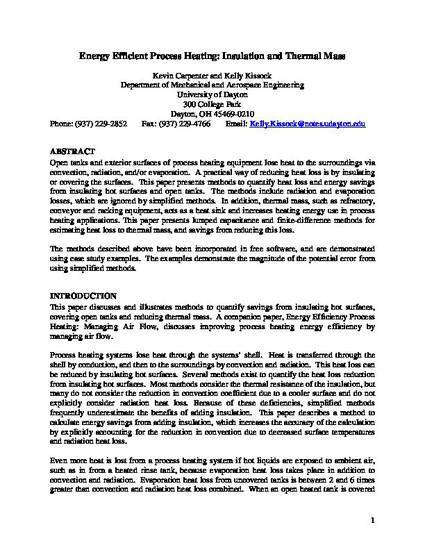 This paper presents methods to quantify heat loss and energy savings from insulating hot surfaces and open tanks. The methods include radiation and evaporation losses, which are ignored by simplified methods. In addition, thermal mass, such as refractory, conveyor and racking equipment, acts as a heat sink and increases heating energy use in process heating applications. This paper presents lumped capacitance and finite-difference methods for estimating heat loss to thermal mass, and savings from reducing this loss. The methods described above have been incorporated in free software, and are demonstrated using case study examples. The examples demonstrate the magnitude of the potential error from using simplified methods. This document is provided for download by permission of the publisher and the author. Permission documentation is on file.